This recurring promotion is coming back at Staples brick and mortar stores for the shopping week of May 21-27 in 2017. The terms are as before, if you buy $300 or more in prepaid VISA gift cards (in a single transaction), the cash register will spit out (or email if you have email-only receipts) an EasyRebate offer that will get you a $20 Staples Gift Card after a few weeks. EasyRebates can be submitted online using data from the cash register receipt. You don’t have to mail anything or make any photocopies. Very easy. As usual, this is profitable if you can get to $300+ with two gift cards (or in very rare cases if you can find one). That’s because each card has an activation fee which eats up your $20 bonus. This offer is particularly good if you have a credit card that gives you 5% cashback on office supplies, such as some of the Chase Ink cards. The VISA gift card promotion is making a comeback at Staples brick and mortar stores during the shopping week of March 12-18 in 2017. The terms are the same as before. 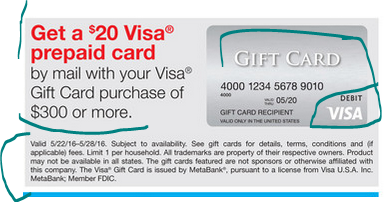 You have to buy $300+ in VISA gift cards. Then you file an Easy Rebate (can be submitted online; nothing to mail in physically) and a few weeks later you will receive a $20 Staples gift card by mail. The rebate using data from your cash register receipt, so it’s easy to do (and works well for them too, since they can verify the purchase directly from the cash register data). The strategy is the same as before, you have to get to the $300 amount using two or one gift cards. $300 gift cards are unicorns (hard to find), so the most realistic way is using one $200 and $100 VISA gift card. This will get you about $7 of profit, which is not bad for a $213 investment and a one month vesting period. Plus, if you pay with a Chase INK credit card, you will receive 5% cashback on your credit card. Then you can use the VISA gift cards on items that would otherwise only get 1% credit card rewards. The VISA Checkout promotion is back at Starbucks! 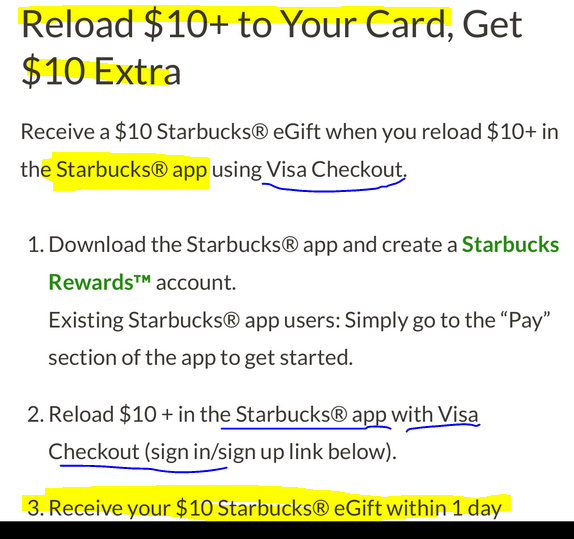 If you load $10 or more, using the Starbucks Mobile app (not their website) AND pay using VISA Checkout, you will receive a $10 Starbucks e-gift card bonus within 24 hours after the reload transaction goes through. It is important for this offer that you pay with VISA Checkout, not a credit card on file. This promotional period runs between 11/29/16 until the end of day on 12/22/16, so you can only use this promotion ONCE per account. 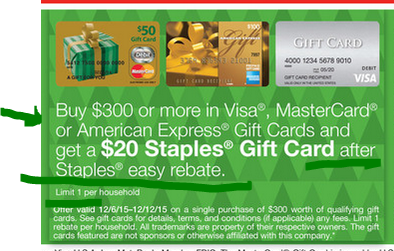 If you are fond of the VISA Rebate offers at Staples, you are in good luck! The promotion returns at their stores for the week of Sunday October 23 until the close of business on Saturday October 29 in 2016. The terms are the same, you buy $300+ in prepaid VISA gift cards, and you receive a $20 prepaid VISA gift card via EasyRebate. 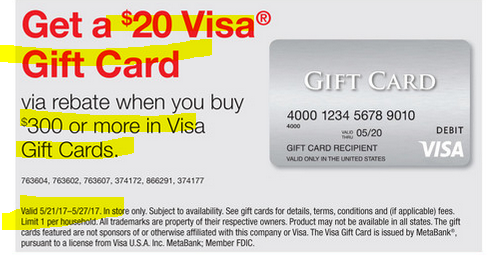 So for this to be profitable, you need to get to $300 with two (or one) VISA prepaid gift cards. The activation fees for the gift cards are $6 for the $100 and $7 for the $200, so with two cards, you pay $213, and receive a $200 gift card and $20 gift card (via Easy Rebate), making it a $7 profit on a $213 investment with about a 1 to 1.5 month “vesting period”. VISA Checkout is trying to buy its way into consumers hearts and minds by offering a variety of discounts across a variety of retailers big and small. Starbucks is one of their “friends” as they have launched another offer running until 9/30/16. It is important to pay attention to the details of this offer. You must use the official Starbucks iOS or Android (Google Play) apps to get the bonus. The web browser will not get you a bonus. You have to load at least $10 on your Starbucks card, using either the iOS or Android app, and use VISA Checkout as the payment method. The bonus is a $10 Starbucks e-gift card delivered to you via e-mail in five business days after you do this according to the Terms and Conditions. I just did this on Android, and it’s a bit confusing, there’s no option to pay with VISA checkout directly, but you can add a credit card using VISA checkout, and then pay using that credit card. If you already have that credit card on your Starbucks account, I don’t know if that matters or not. I just did this on 9/15/16, so I won’t know whether it works until five business days from today. The way the promotion is worded makes it sound like you may or may not get the bonus, so treat this as a YMMV offer. UPDATE: there is a promotion FAQ page with detailed step by step instructions on how to do this! 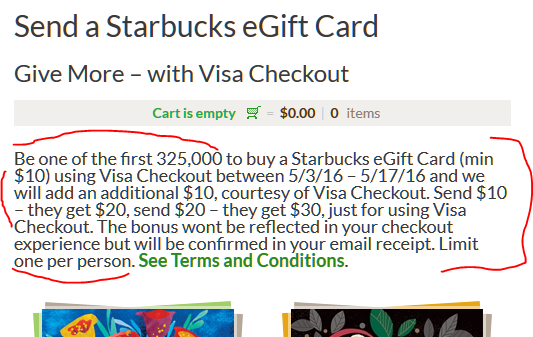 A new VISA Checkout promotion is running at the Starbucks website. If you purchase a $10+ Starbucks electronic gift card AND pay for it with VISA Checkout, you will receive a $5 bonus on the gift card. The promotional period runs between August 4-29 in 2016, so if you haven’t done this already, it’s a great deal! If you previously did this offer (before August 2016), you can do it again. I just did it and it worked fine. You MUST pay with VISA Checkout, not using the default credit card on your account. If you do the minimum, eg you buy a $10 egift card, that’s a 50% bonus! You can email it to yourself, you don’t have to send it to other people/email addresses and jump through hoops. VISA Checkout is funding many promotions like this across the internets as they are trying to generate brand recognition and fend off competition from mobile competitors like Apple Pay and Android Pay and Samsung Pay and PayPal and such. If you are a fan of doing the Staples gift card rebate promotions, we have good news for you! The VISA promotion is returning at Staples brick and mortar stores for the week of May 22-28 in 2016. The terms are as before, you buy $300+ in prepaid VISA gift cards, and you will receive a $20 prepaid VISA gift card by Easy Rebate (you can submit it online, no need to mail anything in). PS: three gift cards (eg three $100) are technically also a money-maker, but a profit of $2 on a $318 investment might be too small for many people to consider it worth their time. Don’t sleep on this offer, because it’s both a limited quantity and a limited time offer! Good until 5/17/16 or when 325,000 people take advantage of it (whichever comes first), if you purchase a Starbucks eGift Card from their website of $10+ AND pay for it with VISA Checkout, a $10 bonus will be automatically added to the gift card amount. You can send this to your own email address or send it to another person’s. Its your choice. Starbucks don’t care but they have a limit of one per customer during this promotional period. 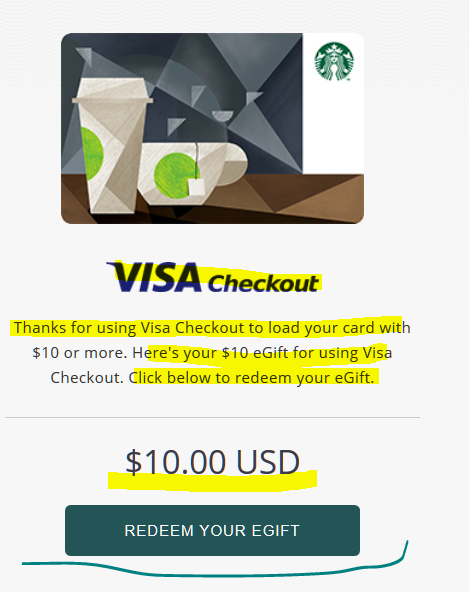 The bonus amount will not show in the VISA Checkout process, but a few minutes after you place the order, you will receive an email from Starbucks with the gift card and that will have a +$10 egift card bonus. If you already have a Starbucks card in your account, you can also directly transfer the new gift card balance to your existing card. It’s only a matter of a few clicks, if you don’t want to shuffle multiple gift cards in your Starbucks app. There’s a new twist in the Staples Gift Card Easy rebate promotion that will run from December 6-12 in 2015 at their brick and mortar stores. The buy $300+ in Gift cards and a get a $20 Staples Gift Card via Easy Rebate is back and this time all three major credit cards are participating: VISA, Mastercard and American Express. TIP #1: these sell out fairly quickly, so if you want a good chance of finding them, you may have to be there as early on Sunday as you can. There are some “professional shoppers” who buy multiple of these, even though it is limit one per customer. Grandma and Grandpa becomes very popular when extreme couponers want to use them as mail-in rebate participants! TIP #2: Gift cards are not refundable, so make sure the items you get are eligible for the promotion and you won’t change your mind. While other rebate items (eg the various copy paper offers) can be returned if you change your mind or you accidentally get the wrong items, gift cards are not returnable. So pay extra attention to the terms and eligible options! Better wake up early on Sunday if you don’t want to miss this. The VISA Easy Rebate promotion is back at Staples brick and mortar stores for the week of October 25-31 in 2015. 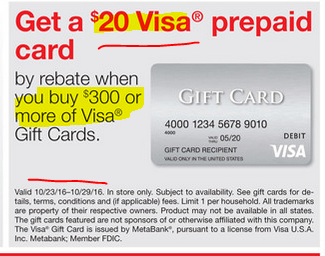 Its the usual offer, you buy $300 or more in prepaid VISA Gift Cards, and you receive $20 back via an Easy Rebate (submitted online). This time the $20 is a prepaid VISA gift card, not a Staples Gift Card, so you have more flexibility in where to spend it. This is limit one per household during this promotion week.